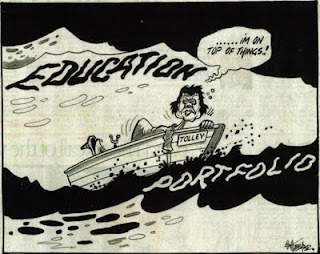 It will be difficult for the Minister to continue to claim that this is just political action initiated by education unions when whole school communities are taking action and the New Zealand Education Institute has mainly focussed on finding professional solutions. The Institute even attempted to engage with the Minister's NS Sector Advisory Group only to find that there was no ability to address the flaws in the standards, its sole function was to facilitate implementation. With such overwhelming opposition the Minister needs to start engaging with the profession and actually start responding to concerns in a professional way. The cracks are now too wide to cover up and reading the odd supporting letter in Parliament is not going hide the reality. Hey, you made it onto the pages of The Standard Dave!